I have literally been dying to share this insanely fresh and fabulous “both”day party with you all! Our little friends Dane & Ryley are each other’s cousins and their fantastic parents (Becky & Brad and Nicole & Andy) threw their kiddos – born only weeks apart – a beachy ‘both’ day party! The invite said “It’s O’FISH’ial! 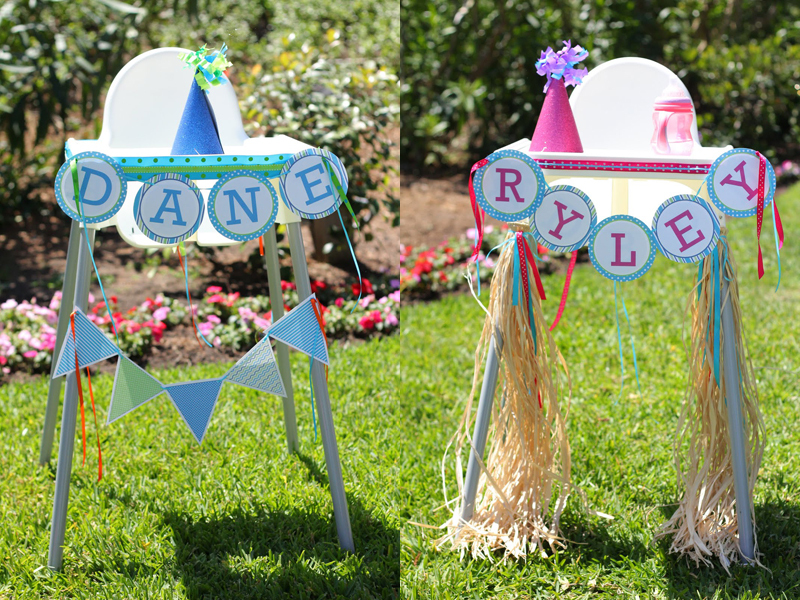 Dane & Ryley are ONE!” (Can you get over those highchairs? Me neither! So cute!) 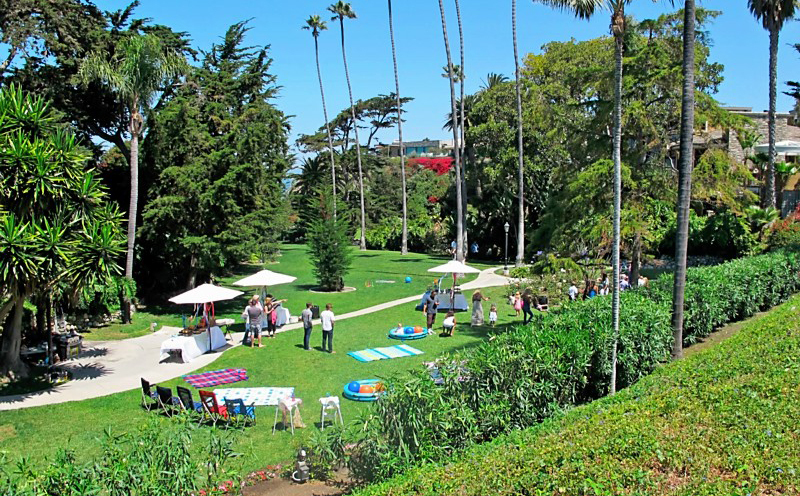 Let’s take a gander at the stunning park they threw this shindig in. Oh and that peak of blue between the trees there? Just the ocean. No big deal. How pretty, huh? There honestly was so much to love here! One of my favorite things is how they managed to make this party cool enough for a boy but sweet enough for a girl. It was such a great example of how to throw a joint party for different sexes. 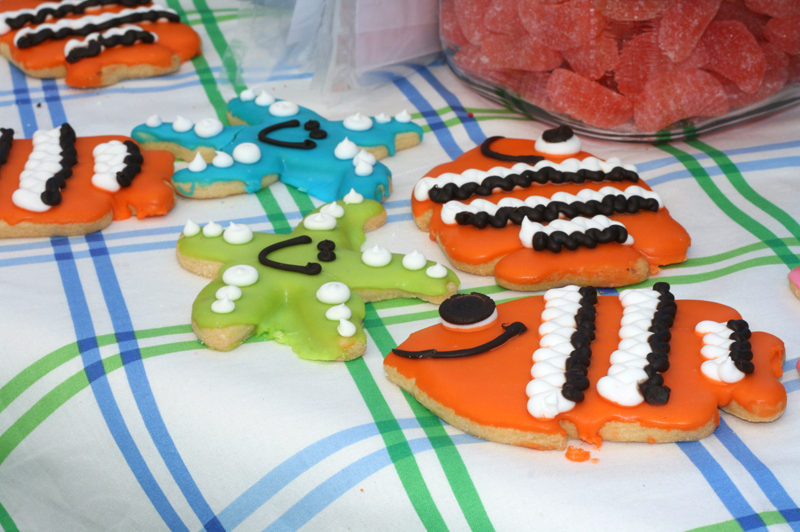 “Catch of the day cookies” from Gwynn Wasson Designs. Oh come on! How cute! 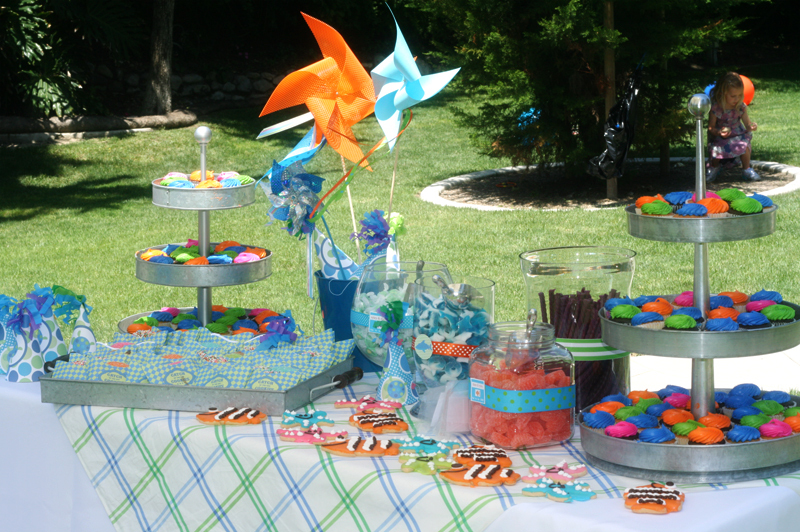 They also used printables from Catch My Party. What a great mix! Their dessert table was so cute! 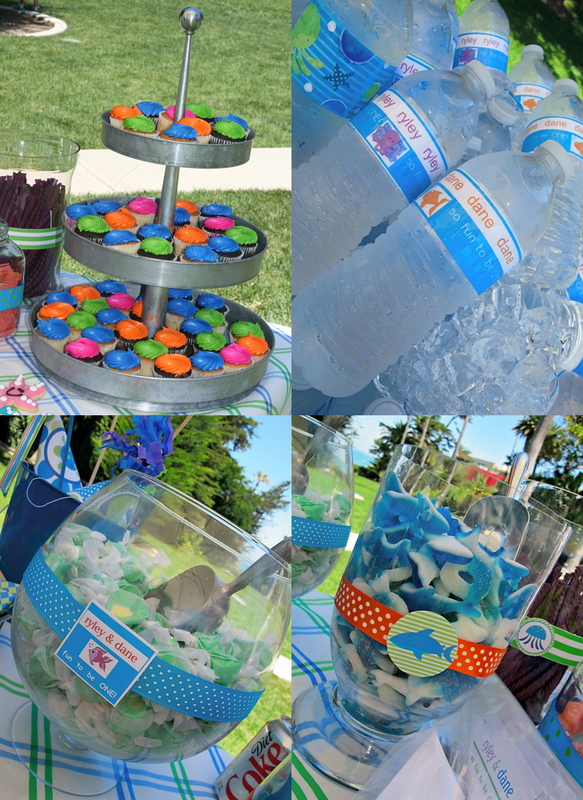 My favorite detail was that the cupcakes matched the balls in the inflatable pools. Such great synergy! 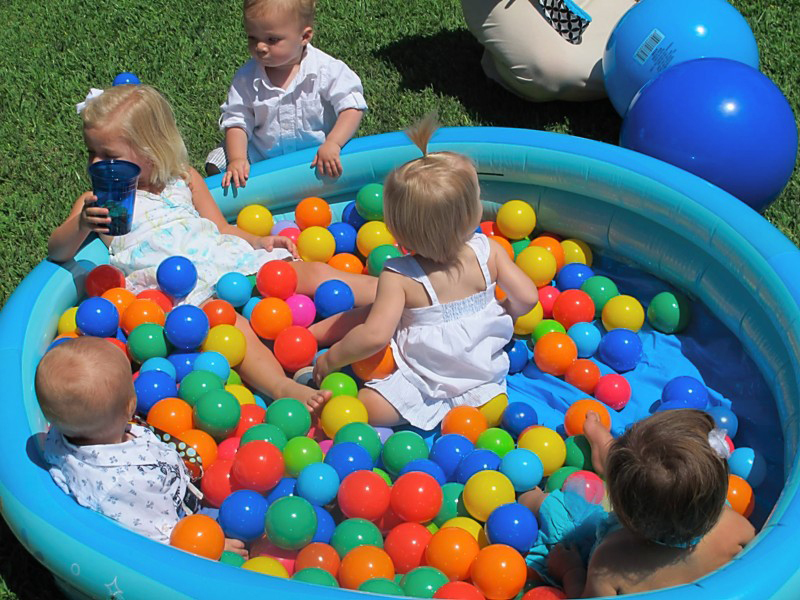 Speaking of the pools, they set up a few inflatable pools from Target and filled them with balls from Walmart ($10 for 150 of them!) They had so many babies there and it was THE BEST activity for them. Added bonus that it was so adorable and theme-related! What a no-brainer! 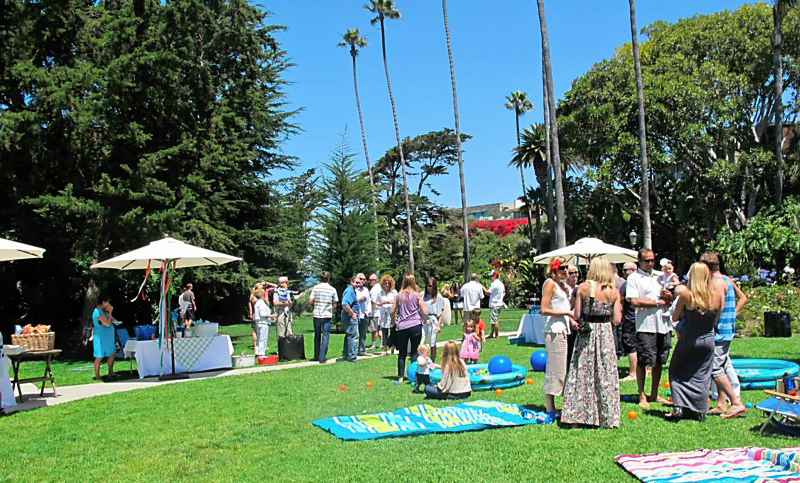 A perfect idea for summer parties! 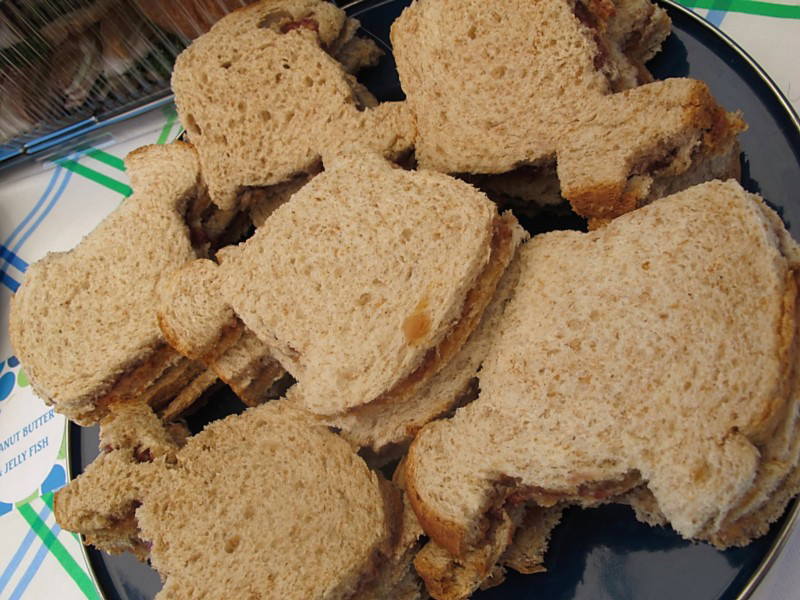 They made PB&J sandwiches for all the kiddos in the shape of a fish. So cute! The grown-up food was pretty cute too. 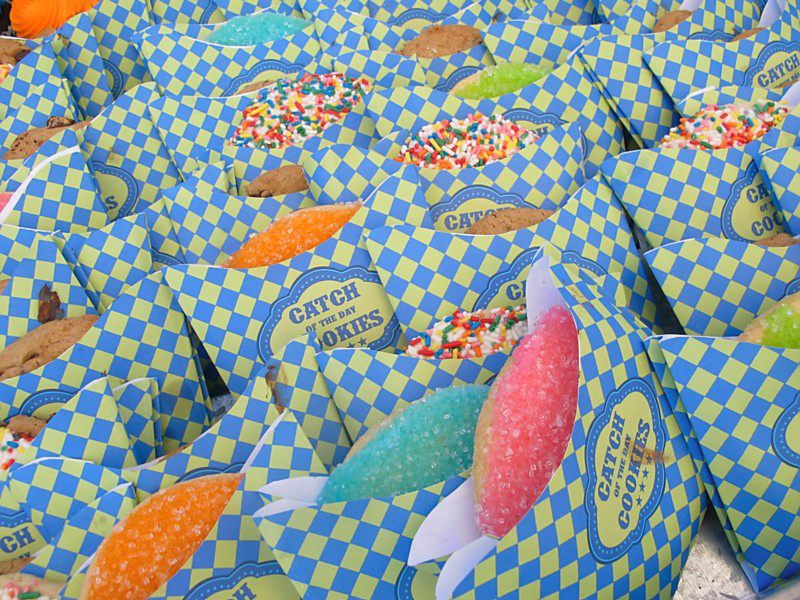 And check out these fishy nibbles. My 3-year-old loved eating Nemo! 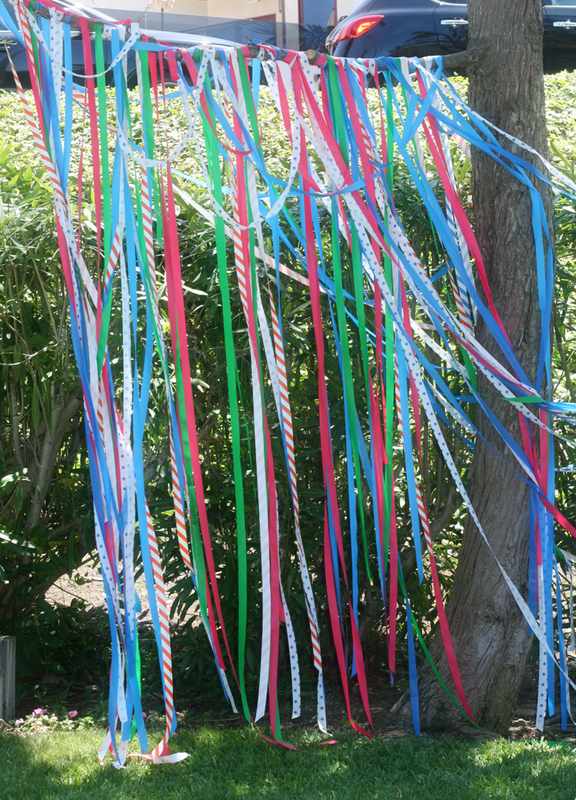 My favorite detail and hands-down the most brilliant thing I have seen in the party world as of late was their use of flagging tape – NOT ribbon – to stream around branches and umbrellas. It looked so whimsical and fun and it was just really quite beautiful. The best part about it? It is CHEAP! What’s flagging tape? It’s what police use as “Caution” tape but it comes in really cute designs and colors. From what I googled it goes for about $1.50 a roll. That’s bananas cheap! 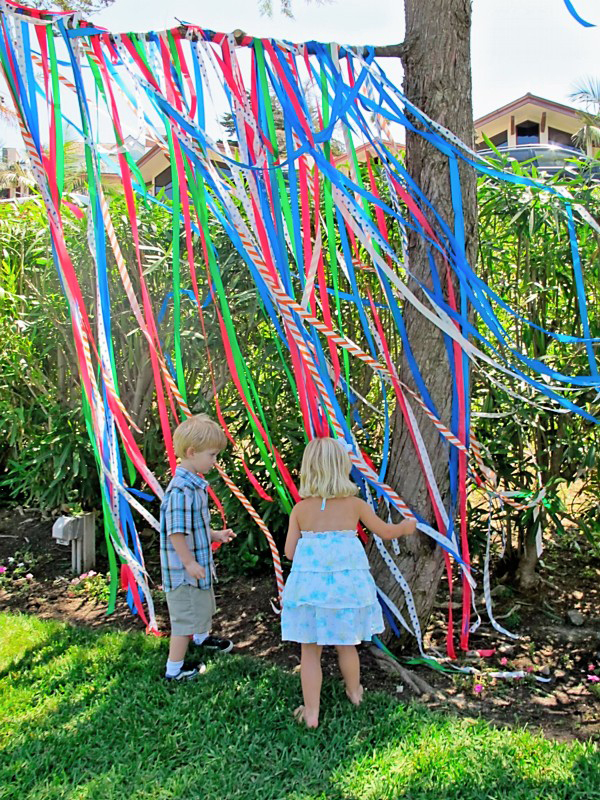 You get the effect of a ribbons without the price. Idea Thieves, take note! This is one worth stealing. (I certainly intend to!) 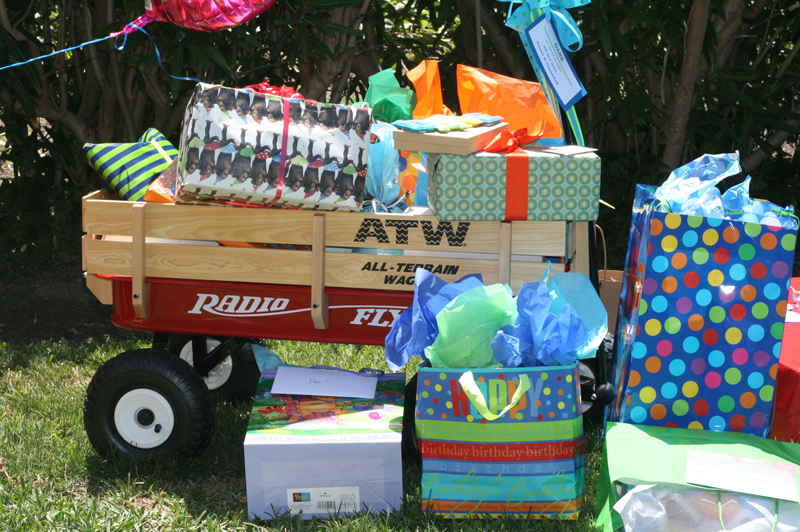 Yet another thing I loved was that they rolled two big wagons down to gather gifts for the wee ones. It not only looked cute, but was totally practical… They just had to roll the wagon to the car and unload. 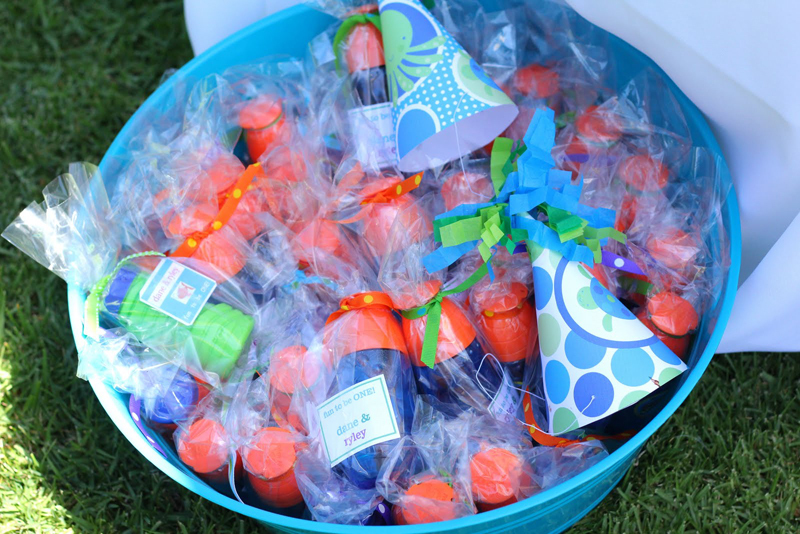 You can’t go wrong with bubble favors. Here’s another view of the park. How cute do all the big blankets, pools, balls, and umbrellas look? What a fabulous first birthday for two of the cutest little wee ones I’ve ever seen. 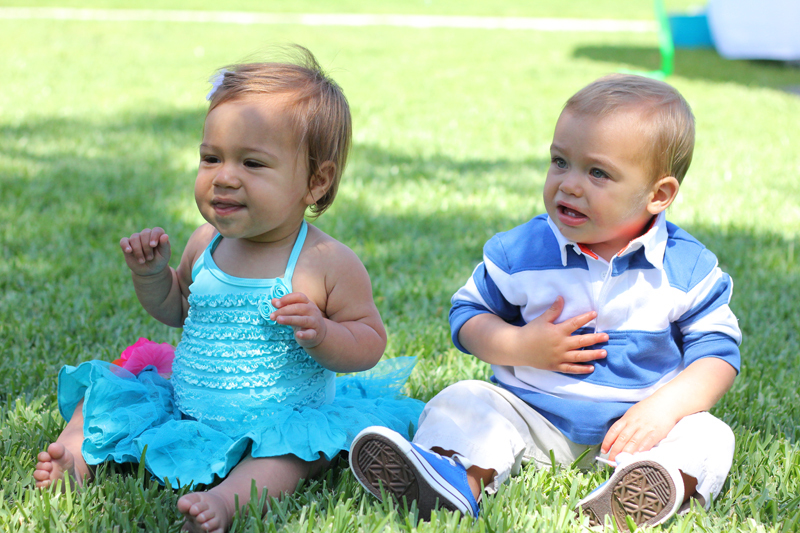 And because who doesn’t like to look at cute babies, here’s a pic of the birthday cousins. To die for right? The party AND the babies! I know that Becky & Nicole worked so hard on making such an adorable party for their little ones, but I’m told that the VIP award goes to Dooey – Dane & Ryley’s grandma Judi. Way to go! What an adorable celebration. Not a detail missed! A perfect beachy birthday for two very darling beachy kiddos. Please note: I had nothing to do with this darling party! (Though I wish I did!) If I missed any of the details and you want a little more information, I am happy to ask the party throwers for you. Just leave a comment below. 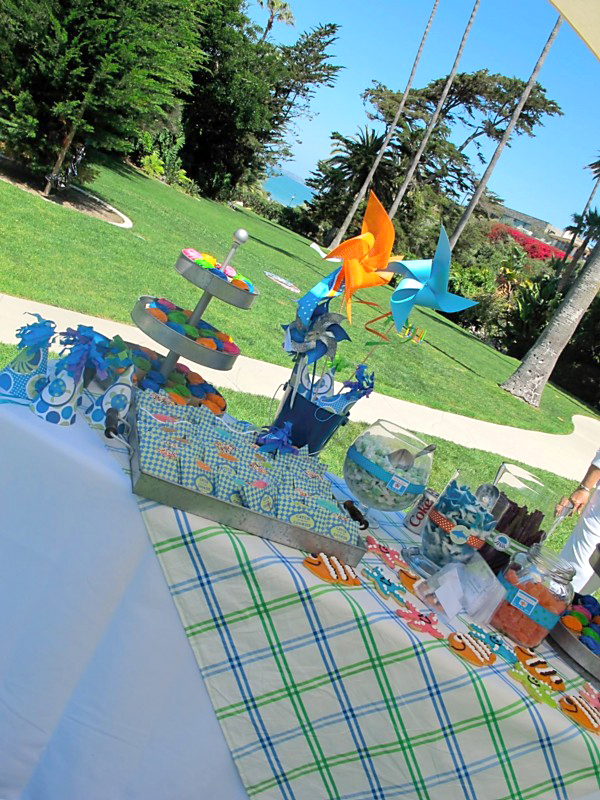 This entry was posted in kid's parties, parties for kiddos, Uncategorized and tagged beach party, fish party, girl and boy joint birthday party, inflatable pool & balls, kid's birthday party themes, pink blue orange green birthday party by Annika. Bookmark the permalink. Where did they get the personalized banners for the high chairs. Where did you get the water bottle label and sweets container labels from?